Grease and flour muffin tins or use cupcake papers (spray inside of papers with oil). Mix oil and eggs in a large bowl with a mixer. Beat in remaining ingredients, except carrots and nuts. Place carrots into a food processor and pulse until finely chopped. 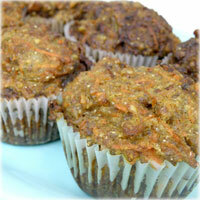 Stir carrots and nuts into muffin mixture. Fill muffin tins or papers ¾ full. Bake at 350° for 30-35 minutes, until a toothpick inserted in center comes out clean. Cool on a wire rack. Makes 24 muffins.